Nedap introduces the new VP604X antenna range that replaces the VP6001, VP6002, VP6150 and VP6151 V-sense antennas as well as the multi loop antenna range (SF3 antennas). 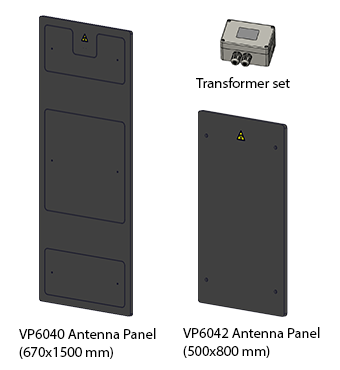 VP6040 Antenna Panel: for walk past ear tag identification. VP6042 Antenna Panel:for walk past ear tag identification. Can also be used for overhead ear tag (rotary parlours). VP604X Antenna Transformer Set: for use of VP604X antennas in combination with readers without auto tuning function. NOT suppress environmental noise!). This antenna is mainly meant to be used as spare part to replace VP6001 and VP6150 antennas in existing installations as the dimensions (mainly width) of the new VP6040 antennas would often require a major reconstruction of the entry race of the parlour and/or sorting facility. The current VP6150 and VP6151 V-sense auto tune antennas and the multi loop antennas will become obsolete and are replaced by this new range. The VP6001 and VP6002 have already been declared obsolete last year.